Investments do not guarantee a return, and the value and the income from them can fall as well as rise, so that you may not realise the amount originally invested. Where an investment is denominated in a currency other than sterling, changes in exchange rates between currencies may cause the value of investments to go up or down. Past performance should not be seen as an indication of future results. This material is communicated by Hottinger Private Office Limited and is a marketing communication issued and approved by Hottinger Investment Management Limited for informational purposes only and does not constitute a solicitation or a personal recommendation in any jurisdiction. Any reference to individual securities does not constitute a recommendation to purchase, sell or hold the investment. Opinions expressed are current opinions as of the date of appearing in this material. No reliance may be placed for any purpose on the information and opinions contained in this document or their accuracy or completeness. No part of this material may be copied, photocopied or duplicated in any form or distributed to any person who is not an employee, officer, director or authorised agent of the recipient, without the prior permission of Hottinger Private Office Limited. Political pundits often describe the seemingly endless process of Brexit as a game of three-dimensional chess. At the centre of the drama, we have the sitting Prime Minister, Theresa May. She perseveres with the deal she painstakingly negotiated with the European Union last year but which was resoundingly rejected by the British Parliament in January. Her hope is that as time passes, alternatives to her deal will fall away and Parliament will grudgingly approve her plan into law. But there are also three other players – groups or individuals – with the power to shape the outcome of this process. First, we have the European Research Group (ERG). On a good day, this group can command the support of up to 100 Tory MPs, but analysts put its core membership at around seventy. The ERG largely hates May’s Brexit deal and, up until a few weeks ago, it had privileged access to Downing Street. In exchange for their votes, the ERG wants the PM to renegotiate her deal with the EU to remove or put a time limit on the so-called ‘backstop’, which would indefinitely keep the UK in a customs arrangement with the EU if the two parties do not agree a comprehensive trade deal after Brexit. Otherwise, the ERG would try to force a no-deal exit, which economists predict would have damaging consequences for the UK. However, the power of the ERG has significantly weakened in recent weeks as a result of moves by two other groups. The first of these is what I call the ‘Tory-Remain caucus’. This is a group of thirty or so Conservative MPs – including ministers in the government – who would prefer either a second referendum or the softest possible Brexit. Last month, three MPs from this group – Heidi Allen, Anna Soubry and Sarah Wollaston – joined a new Parliamentary grouping called The Independent Group (TIG), formed by ex-Labour MPs who have similar views on Brexit and are dismayed by the Labour party’s official policy on it. The third player is an individual in the mould of Jeremy Corbyn, Leader of the Opposition. Jeremy Corbyn leads a Labour party that mostly aches for either the softest Brexit or remaining in the EU. However, Corbyn has been averse to the club for most of his political life and his personal position, against that of the party, had empowered the ERG. But, with the emergence of TIG, Corbyn has been forced to promote a second referendum. In recent weeks, two major events happened that make a soft Brexit more likely. The threat of resignation from three Tory government ministers has forced Theresa May, who has a working majority of just seven MPs, to concede the option of delaying Brexit if her deal does not pass. Further, with Labour committing to a second referendum during the delay period and enough Conservatives willing to consider it, the risk of ‘no Brexit’ has risen. Therefore, more members of the ERG are now more willing to support Theresa May’s deal as the risk of losing Brexit altogether has increased. With Parliament supportive of a soft Brexit of some description, the likelihood of an orderly Brexit and a deal of some description eventually passing Parliament has risen. This could have significant consequences for UK assets, particularly from the perspective of foreign investors. One could argue that for foreign investors there are three sources of value from UK equity assets: an undervalued pound, a discount in equity valuations, and the continuation of high dividend yields that many UK equities can offer. For domestic investors, the last two factors apply. Of course, nothing is guaranteed. Prices and currencies can rise and fall, while the occurrence of events does not necessarily lead to market movements in the expected direction. Let’s now take each of these factors in turn. On currency, Figure 1 shows the trade-weighted sterling index dating back to January 2000 to give an indication of its medium-run trading range. The median level for the index takes into account about half of the large depreciation in sterling during the financial crisis. The chart shows that before the EU referendum the pound was trading just below its median level before depreciating significantly. 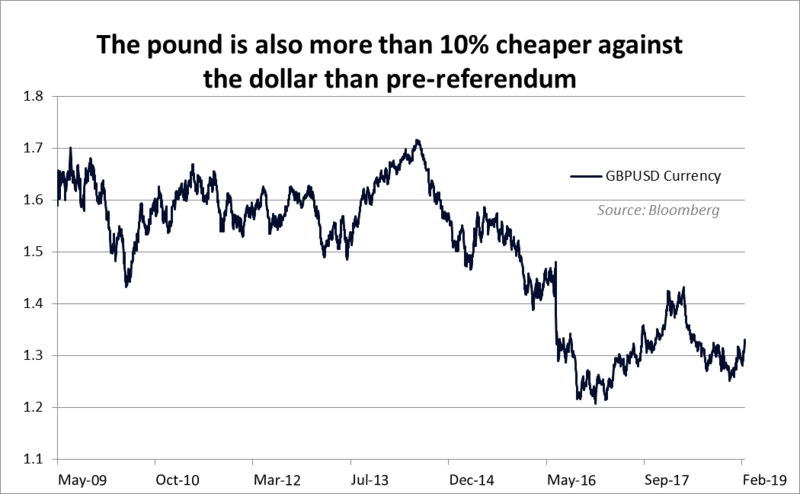 Since the referendum, sterling has been trading in a relatively narrow band, representing a discount of roughly 15% to the medium-run median. 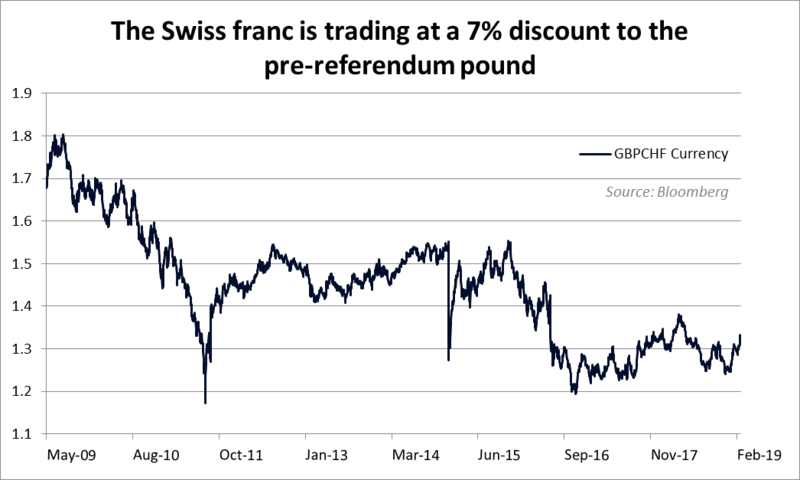 The following three charts show the discount in the pound sterling against other currencies individually – the euro, dollar and Swiss franc, respectively. 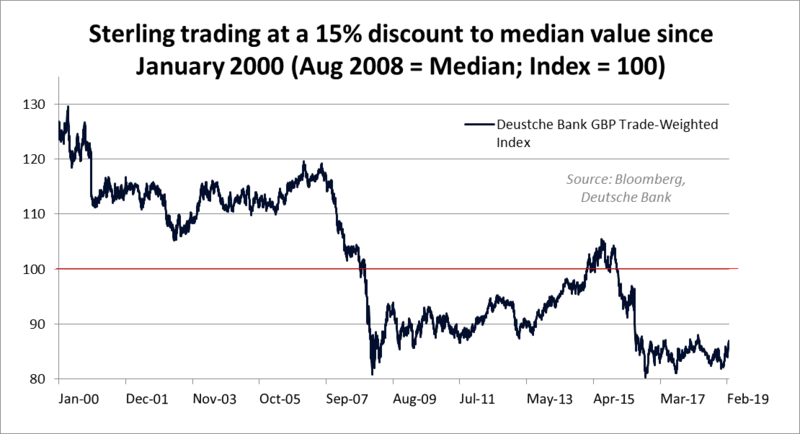 The start of each series reflects the median value of each currency pair since January 2000; these were £1 to $1.57 in May 2009, £1 to €1.28 in October 2008, and £1 to CHF 1.67 also in May 2009. Figure 2: The British pound sterling against the euro since October 2008. Figure 3: The British pound sterling against the dollar since May 2009. Figure 4: The British pound sterling against the Swiss franc since May 2009. The three charts collectively corroborate Figure 1, showing that sterling is trading at about a 10% discount to its level on the eve of the EU referendum. 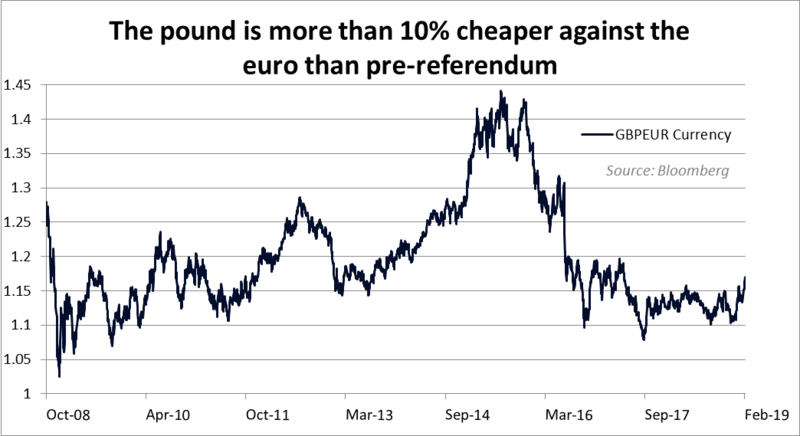 Arguably, the discount reflects investor expectations that Brexit would lead to a deep rupture of the trading relations between the UK and the rest of Europe. 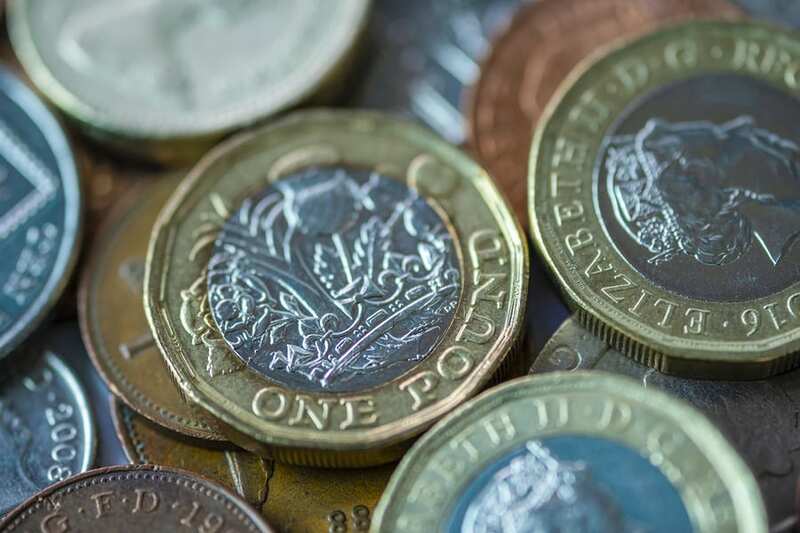 If recent developments in Parliament suggest that the UK will maintain a closer relationship with the Continent than previously expected, there could be a post-Brexit recovery in sterling which would increase the foreign-currency value of UK assets. 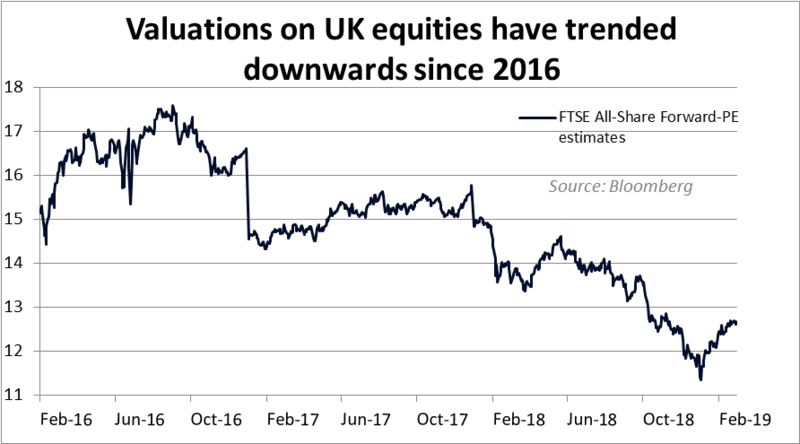 The second factor that may suggest opportunities in UK equities is the trend in valuations over the last three years. 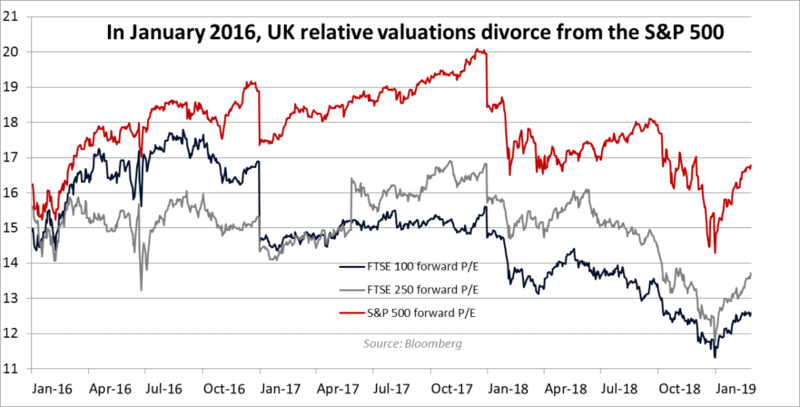 Despite the bull market environment over the last few years in the US equity market, valuations in the UK have gone in the other direction. In the period running up to the EU referendum in 2016, UK stocks included in the FTSE All-Share index of 600 of the country’s largest companies were trading at over seventeen times (17x) their expected earnings or net profits. In the post-referendum period, this multiple has fallen to as low as 11.5x expected earnings during the fourth quarter of 2018, as Figure 5 represents. Multiples have since rebounded modestly. Figure 5: Estimates of the forward PE ratio of the FTSE All-Share index, representing 600 UK-listed companies. The FTSE All-Share Index includes companies that have significant export exposure to the EU as well as domestically-focused companies that may have been swept up in the negative investor sentiment towards the UK as a result of the Brexit vote result. Despite the UK being unloved, British company earnings and dividend yields continue to be strong, suggesting that their stocks are under-priced. Last year, UK companies made a record dividend pay-out of just under £100bn, up 5.1% on 2017. According to Morningstar, the average trailing yield on UK stocks last year was 4.8%, the highest level since March 2009 and significantly higher than the 30-year average trailing dividend yield of 3.5%. With 10-year gilts yielding 1.3% at the time of writing, and with little indication that the Bank of England will raise interest rates soon, it could be argued that a resolution to Brexit that alleviates uncertainty could push company valuations back up. While valuations appear to be suppressed, the high dividend yield when reinvested has enabled UK companies to keep pace with global markets on a total return basis, as Figure 6 shows. January 2016, which marks the start of the data series for the chart, was the beginning of a synchronised upswing in global and UK equity prices. But it was also when UK relative valuations deviated from other markets, especially the U.S. S&P 500 stock market, as Figure 7 illustrates. High dividend yields in the UK have, therefore, partially offset the effect of the fall in valuations on total returns. 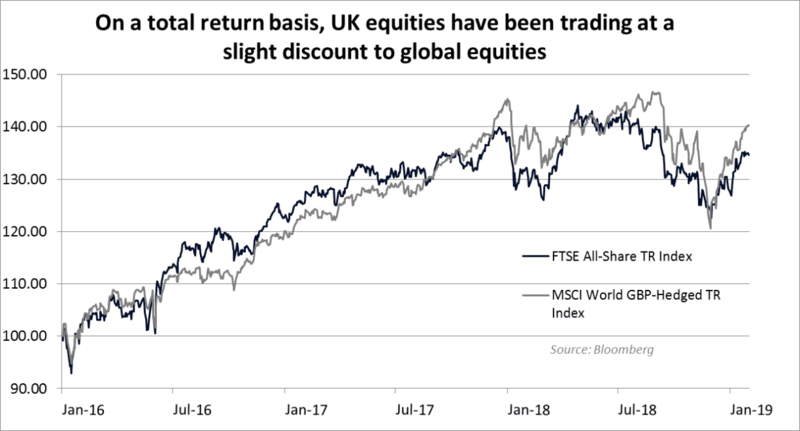 Nonetheless, even on a total return basis, the UK is still currently a bit behind world markets and has been for most of the period since the start of 2018. Figure 6 informs us that looking at valuations alone to judge the size of the UK opportunity may be misleading. However, we should point out that as share prices rise, the yield from earnings and dividends for investors who come in at higher prices can fall. Figure 6: Estimates of the forward PE ratio of the FTSE All-Share index, representing 600 UK-listed companies. The figure starts in January 2016 at the same index value of 100 for both the FTSE All-Share Total Return Index (representing UK companies) and the MSCI World GBP-Hedged Total Return Index (representing global companies in sterling terms). Figure 7: Estimates of the forward PE ratio of the FTSE 100, FTSE 250 and S&P500 since January 2016. One could therefore argue in conclusion that the now more likely event of an orderly Brexit, whether on March 29th or after a short extension, could create an investment opportunity in UK markets. For foreign investors, there is possibly an additional benefit if sterling begins a period of strength that pushes the currency towards its median level.